The Ohio Nature Blog: Turtle Mania! How Many Species in this Photo? Expecting warbler mania? Well, this past weekend was the major fallout for warblers in Columbus. I've been hearing buzzing and warbles here and there in the evenings, but Sunday morning was awesome for warblers. It was also awesome for turtles! I literally saw dozens basking along the banks. Here's a little turtle quiz. There are three species pictured here. The question. Which species are in the photo, how many of each species are there, and which ones are which species? This post is partially inspired by Mary at faith, fabric, and photos who asked me to ID some turtles on her blog! If you don't know the names, can you separate the three species? And can you see how huge these things are? The mallard duck is in the photo for a size reference. Have fun, I love turtles, I hope you do to. Hints: This photo was taken this past Sunday on the Olentangy River behind our house here in Columbus, Ohio, which is a relatively small tributary to the Scioto. I've posted the photo at full resolution, clicking on the photo will allow you to view much more detail in the image. This is a great shot, unfortunately IDing turtles from the shells is definitely not my strongest ability... but you have the obvious spiny softshell, a few (3-6) red-ear sliders and at least 1 common map turtle. Thanks for weighing in. Anybody else have any additional thoughts? Nice picture! I can't identify them but still love them. I use to have two water turtles (Fred and Wilma). I hated feeding them goldfishes, but you gotta do what you gotta do! Great photo. That is crazy that you found so many at one spot. Thanks for sharing the shot. Great post. Smooth softshell, multiple Ouachita Map turtles and a painted turtle on the very end?? I like turtles, too--but I don't see many of these near me! 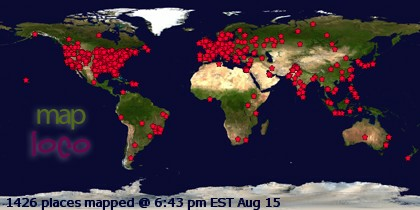 Thanks everyone, this is definitely fun. We're racking up the names of Ohio's water turtle. Nina- yours are great guesses. Tom: Since I only know three types of turtles (Softshell, Snappers and Painted) I'm sure I'm in for a lesson. I have caught while fishing all three of the above. I don't see a snapper for sure. How many turtles can you get on a log? It looks like as many as can fit and throw a few around on the ground also. what a wonderful photo. Gee, if you are going to be kind enough to mention my blog, I certainly have to look at this closely.....however, you already know that I'm no good at identifying turtles :-) I see the big soft shelled one on the bank and can't wait to know what it is! I really can't separate the other types. You must be a good teacher...you have lots of us joining in on the fun. Have no idea what the names are. I just love turtles. I'll be interested to learn what you have to teach us. Ryan is definitely on to something. Ouachitensis are only known from the Scioto river drainage, but I am pretty sure they have never been seen as far north as Columbus. Smooth softshells are fairly common in the right habitat and can be found in the Scioto river drainage. Again I don't think any have been found that far north in the Scioto, although it is definitely possible. In my experience they tend not to bask as much as spiny softshells though and they also don't reach as large of a size. Tom, this is a great shot. Where I come from (that's Borneo Island), I could only dream to have seen this in real life. Truly a rare sight indeed for me. I'm next to useless at identifying turtles, but love them lots. We have plenty of softshell snappers over here, they tend to be quite hardy and live off small fishes in the streams even though the water is kind of "dirty" and stuff. Great picture! 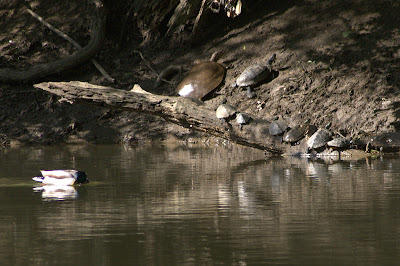 I don't know anything about turtle ID, but to me it looks like there is 1 big softshell turtle on the bank, 6 turtles that have a prominent ridge running down the middle of their shell (one on the bank and five on the log), and 1 turtle at the lower end of the log with a different shell. Kathleen- You are an excellent biologist and very observant. You are definitely on to something here! You've certainly picked up on one of the characteristics that I also used to separate these turtles. With that being said, does any one else have any thoughts? The three species have been mentioned, but no one has been able to get the numbers right. I have to say that Kathleen has been the closest, now we just need somebody to match up her observations and put species names on them. Ok, I kept reading thinking you were going to give the answer, but you didn't. So here is my shot: 1 spiny softshell, 6 common maps, and one red-ear slider. Someone dropped off a turtle they found on the road the other day - and I've been trying to ID it...so I've done a lot of research. Prior to yesterday, I knew only the red-ear slider by site...but I'm improving. How did I do, Tom? Not Bad at all. Actually, quite good!